There is currently no curative treatment for patients with mtDNA disease. For many women carrying mtDNA mutations their overriding desire is to have a normal child. There are a variety of reproductive options available for women with mtDNA mutations including genetic counselling, ovum donation, antenatal diagnosis (by CVS biopsy) and pre-implantation genetic diagnosis (PGD). However for many families these techniques are not appropriate and we have been working on developing techniques to prevent transmission of mtDNA disease. We have recently shown, using abnormally fertilised zygotes, that this is a viable option in humans. 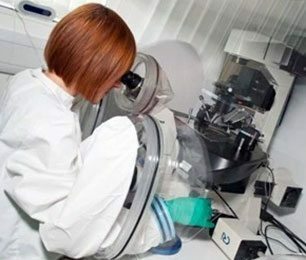 This is a crucial first step and we now wish to determine the safety and efficacy of different techniques in normally fertilised human oocytes by exploring embryo development and assessing human ES cell lines. There is currently no curative treatment for patients with mtDNA disease. For many women carrying mtDNA mutations their overriding desire is to have a healthy child.